Create and share unique new worlds for your Sims with The Sims™ 3 Create a World Tool – BETA. Step into the shoes of The Sims 3 development team and use the same robust world-building tool they use to create your own Sims world and then share your world online. The SIMPOSIUM Fan Event is finally here! We have some of our top custom content creators and top fansites here to preview The Sims 3 World Adventures expansion pack and other exclusive demos! They're blogging, Tweeting, and Flickr'ing live from the event! Share in the fun and see their exclusive updates. We've acquainted ourselves with your scary Sims, crept through your creepiest lots, shivered through the most spine-tingling stories, and screamed while watching suspenseful machinima. These showcase highlights are now up and they are freakishly fantastic! The Good Life - Champs Les Sims, France offers the cultural elite some of the finer things in life. Sims can learn the fine culinary art of nectar making, or flash over with a camera to learn the Photography Skill. This beautiful country town is sure to please the senses and invigorate the soul. Civilized Folk - Settled towards the end of the Medieval Period, Champs Les Sims has a rich history and culture. From the arts to delicious culinary delights, this small French town has everything Sims need to live a comfortable life. Try Your Feet at Nectar Making! Sims fascinated by Gardening and the culinary arts can now refine their talents by learning the nectar making skill. Combine your own fruits with new types of grapes or other fruits to create unique Nectar combinations. After stomping the fruit, the nectar maker processes the juice into delicious nectar. Sell, trade or enjoy these new flavors! Sims can learn all about nectar making by using the nectar maker from the Nectary or by reading books bought in France. The Nectary in Champs Les Sims should be visited by any Sims interested in nectar making or for purchasing nectar making equipment! But, Beware - The Nectary isn’t just a tourist location for those who enjoy the flavors of nectar, but the site of one of the deadliest and most expansive tombs in the world. Exploration - The Celtic Burial Mound is a relatively safe tomb for new travelers to explore. Look for it in the far corner of town – it’s the large mound covered with ancient, mystical looking stones. The Faerie Tomb has long been hidden, though it’s just waiting for a new explorer to discover its secrets. Complete the first section to gain access to the vast riches tucked away on the island. Café - The Champs Les Sims marketplace is a great place to purchase new French Recipes and Nectar Making equipment! It’s also a great place to sit and enjoy a cup of coffee or delicious local crepe. Solve the Case - Think you’re up to the task of solving the mystery of the wily Jean Necteaux? Take on an adventure in France and see where it leads! Tour Time - Take a tour of the local museum, which showcases relics and artifacts from all around the world. The Museum is a great place to look for treasures that inspire you to adventure and explore. Creatures! - Collect new local wildlife like Frogs and Snails and take them home as pets. Not by Foot - Zip around town on a cool new scooter and take in the sights and the fresh country air! The Sims 3 SIMPOSIUM is almost here! On October 29-30, 2009, we’ll be hosting our first SIMPOSIUM Fan Event to preview The Sims 3 World Adventures expansion pack – and we want you to share in the fun! We'll have a special page starting tomorrow where you can watch our real-time updates on Facebook, Twitter, and Flickr live from the event! Get the exclusive scoop from the game team and attendees as they come in! SimAnimals™ Africa NOW IN STORES - Tame African Animals, Discover Their Secrets, & Control The Wild Kingdom! One week only Set Sale! 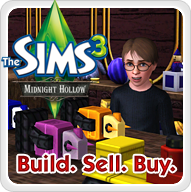 Visit The Sims 3 Store to find huge savings on the Hewnsman and Storybook Sets! The Sale ends Thursday, October 29th so shop quickly! Here are some random blooper screenshots from The Sims 3 World Adventures that the development team captured this week. Death has always been a key figure in The Sims games—dark, yet amusing! In Egypt, he watches on as a ghost Sim battles against a mummy and eagerly awaits the end results. The Sims 3 World Adventures Exclusive Extra Game Content* and Bonus SimPoints*! Receive exclusive extra game content and bonus SimPoints when you register World Adventures! Register your copy of The Sims 3 World Adventures and log onto TheSims3.com to download exclusive, new Explorer’s Loot content for your Sims, plus get 1,000 SimPoints to purchase items on The Sims 3 Store. Secret hints and clues to adventures, exclusively available in Explorer’s Loot Set. Get exclusive, all-new content when you register your game! Prepare your Sims for adventure with the Explorer’s Loot download. Unlock the secrets of tombs, catacombs and caves with mysterious maps. Deck out your Sims homes with exotic Egyptian furniture, Chinese décor, and more! Get 1,000 SimPoints to customize your game with additional in-game items from The Sims 3 Store. The Sims 3 Store includes hundreds of all-new items for you to download into the game. The Sims 3 Store features a variety of new outfits, hairstyles, furniture, home décor, and architectural items to customize your Sims appearance and houses in all-new ways. Enrich your Sims lives with popular sets such as Steampunk, UltraLounge or Jet Set. * SIMPOINTS HAVE $10 VALUE AS OF DATE SIMPOINTS ARE AWARDED. LOOT AND SIMPOINTS INCLUDED WITH FULL RETAIL PURCHASE, EA ONLINE ACCOUNT AND PRODUCT REGISTRATION WITH SERIAL CODE ENCLOSED WITH THE SIMS 3 FULL PRODUCT SOFTWARE. INTERNET CONNECTION REQUIRED. ONLY ONE EA ONLINE ACCOUNT HOLDER IS ENTITLED TO REDEEM INCLUDED LOOT AND SIMPOINTS. YOU MUST ACCEPT THE SIMS 3 STORE DIGITAL SERVICES AGREEMENT TO RECEIVE SIMPOINTS. SIMPOINTS CAN BE EXCHANGED FOR VIRTUAL ITEMS AT THE SIMS 3 STORE, ARE NOT TRANSFERABLE AND ARE NOT REDEEMABLE FOR CASH. One Week Only - Animals Abound Set Sneak Peak Sale! For ONE WEEK ONLY, the Animals Abound Set is on SALE for only 850 SimPoints! Be sure to get this hot NEW Exclusive set during the Sneak Peak Sale before it goes to regular price on October 16th! Get a FREE ITEM when you purchase your NEXT SimPoint bundle! A Perfect Promotion for The Sims 3 Store Shoppers! Purchase another SimPoint bundle and get a FREE hot item! Hurry, this promotion ends November 30th! New EXCLUSIVE Sets at The Sims 3 Store! You Sims’ will love the new sets we’ve added to The Sims 3 Store! Steampunk is back with even more! And don’t forget to spice up your Sims’ wardrobe with the Steampunk Savvy set! Celebrate the joys of autumn with the FREE Harvest Bounty Set!